Breeding Beagles is no easy task: the breed is loaded with history and it’s consistently ranked as one of the most popular breed in North America and Europe. We’ve asked Laura Short, breeder at Short Acres Beagles, for some pointers on how to breed Beagles the most appropriate way. 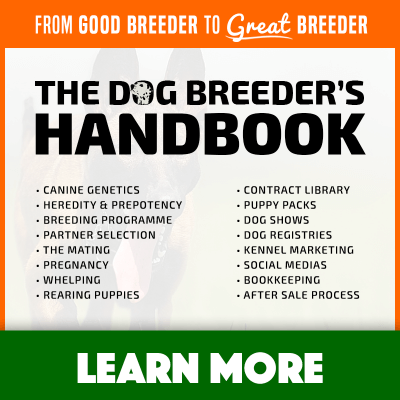 Like all of our interviews, there is a clear focus on the best breeding practices for a given breed, and it’s the point of view of a single breeder — Laura, for this instance. Feel free to drop a comment below to engage in a constructive conversation. Why Beagles, and how did you come to the decision of breeding them over simply owning them? When I was a small child, my father bought our first Beagle that I named “Baby”. My father began breeding Beagles (he had previously bred Foxhounds) primarily for hunting. I helped to raise and socialize the puppies. This taught me a lot about dog breeding and deeply rooted a passion for the Beagle breed in my heart. I have many fond childhood memories of growing up with “Baby” and her daughters. The transition from owning Beagles to breeding them came when I decided that I wanted to breed my own bloodline of Beagles. I purchased my first registered Beagle in 2002 and bred my first litter in 2004. Although I have learned some difficult lessons in dog breeding, there is also the joy of receiving feedback from my puppy buyers saying that the Beagle they purchased from me is the best dog that they have ever owned. Those moments make the hard work of breeding dogs all worth it! Number one would be Beagle breeders not putting enough emphasis on the importance of selecting for good temperaments in their breeding program. The majority of Beagles that are born will eventually become companion pets. In my opinion, a good temperament should be the most important trait when breeding any breed of dog. You should ask yourself if you could live with this dog’s temperament as a family pet, before you consider breeding the dog. If you could not live with the Beagle as a pet, why are you breeding them? Number two would be not health testing prior to breeding. With the advancements in science and DNA testing available, there is no excuse not to have a full DNA test panel done prior to breeding your dog. From there you can see if your Beagle carries any hidden recessive traits and choose a mate who does not have any of the same undesirable genes. 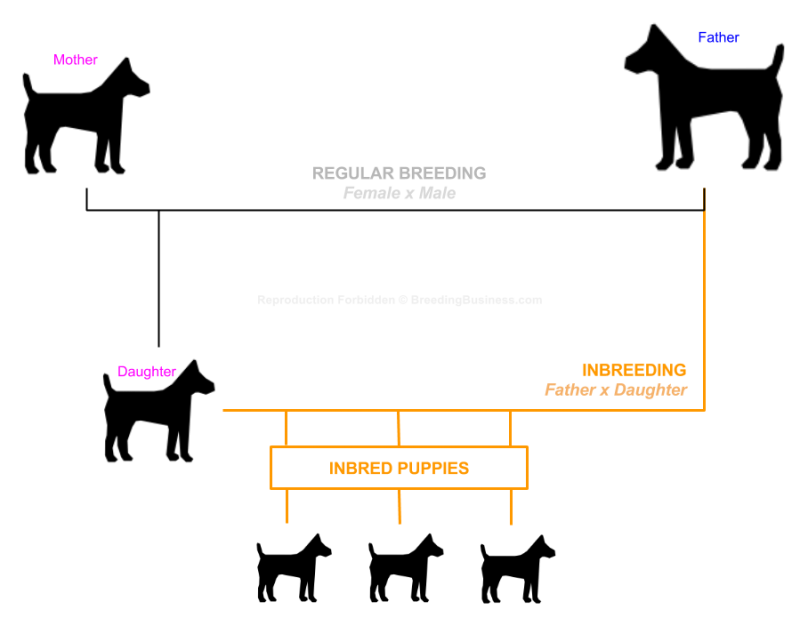 Several companies can also tell you the percentage of inbreeding in your Beagle, which can help in mate selection. Number three would be not working together to improve the breed and our bloodlines. 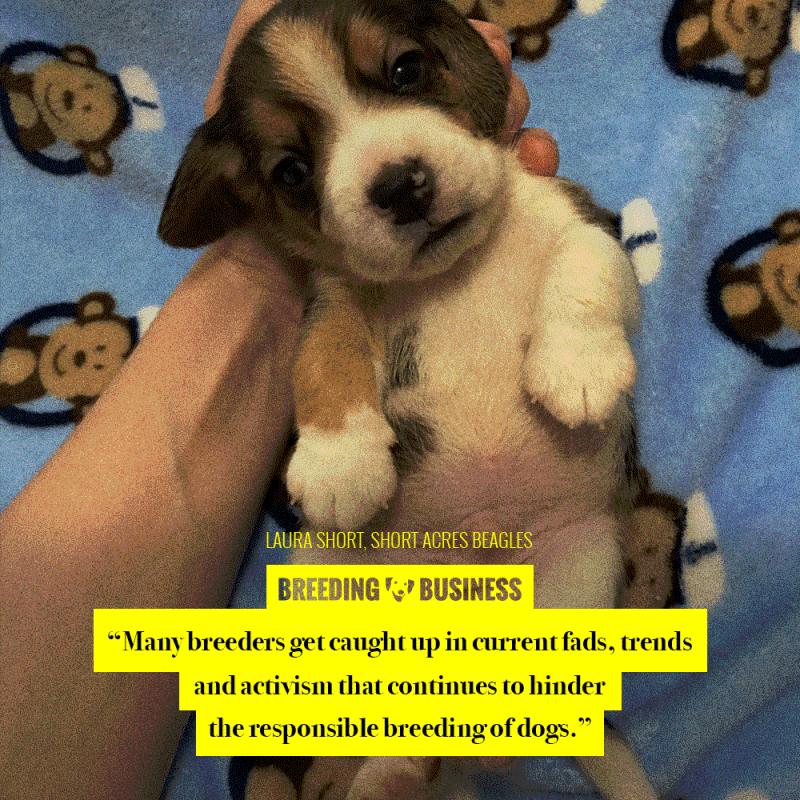 Many breeders get caught up in current fads, trends, and activism that continues to hinder the responsible breeding of dogs. We need to work together, educate the public on the importance of responsible breeders, and share our bloodlines with other responsible breeders. If a breeder never allows anyone to breed a dog from their bloodline, are they really bettering the breed? Or are they unwittingly allowing the bloodline that they love to be eliminated from the gene pool when they are no longer actively breeding dogs? Are you really doing what is best for your breed by not allowing any of your puppies to have full registration? Maybe you should consider carefully mentoring and bringing in newcomers to the world of dog breeding when they show an interest in dog breeding instead of shunning the idea. We all started somewhere! As a dog breeder, hype and trends are the last things you want to follow. 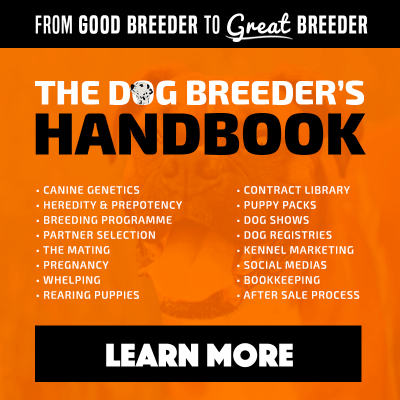 Focus on your dog breeding program and hone in on your skills and knowledge. You love dog shows, and you shine at them! What is one of the frequent judging mistakes you witness in dog shows? I feel that judges are only human, we all make mistakes. One of the most frequent judging mistakes (in my opinion) is when a judge awards a top winning dog in any breed, primarily due to the dog, owner, or handler’s popularity (or fear of reprisal) instead of awarding the most correct dog presented to them in the ring on that day. I would like to see them only judge dogs based on their own comparison to their breed standard; not based on the popularity of the dog, their owners, or their handlers. For example, if only the dogs who were closest to their breed standard were awarded at dog shows, many breeders would breed more towards their breed standard. When judges choose a dog only based on one or two good qualities, it encourages breeders to only breed for those qualities which judges are awarding in the show ring. In turn, this is why we see fads change in breeds. For example; one year, breeders may be breeding primarily for a certain head shape because that is what is winning in the show ring this year. Then the following year, breeders may be breeding primarily for a certain tail set because that is what is winning in the show ring this year. When judges award the most overall correct dog, they are encouraging breeders to breed towards what is correct in their breed standard and discouraging breeding for fads in the show ring. How is the National Beagle Club of America helping breeders? The National Beagle Club of America supports and sponsors dog conformation shows, field trials, and performance events. These events allow judges to compare dogs bred by Beagle breeders across the country to the breed standard, and judge the Beagle’s ability to perform as the breed was intended. These events also allow Beagle breeders to network with each other as well as compare their breeding stock. I think that the best Beagle breeders are those who know how and when to use inbreeding, linebreeding, and outcrossing. There is also a Standard of Care Guidelines for supporting members of the National Beagle Club. 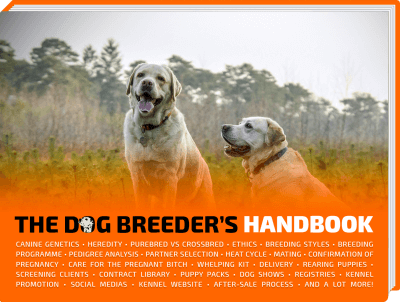 This helps breeders by establishing a set of guidelines for care, breeding, puppy sales, stud service, and conduct. either a cardiac exam or thyroid evaluation. Could you please share your thoughts on inbreeding and/or line-breeding with Beagles? Do you use these breeding techniques, and if so, why? The pendulum swings in a different direction based on current fads, trends, and research with each new generation of Beagle breeders. I think that the best Beagle breeders are those who know how and when to use inbreeding, linebreeding, and outcrossing. I primarily focus on distant line-breeding (4 to 6 generations back) with occasional closer line-breeding (3 to 4 generations back). I do not like to inbreed because you are doubling up on both the good genes and the bad genes. I have yet to find a Beagle that I felt was “perfect enough” in temperament, health, and conformation to make the risks involved with inbreeding worth taking the chance of possibly producing puppies with health problems. When my father bred Beagles, he bred several litters which were inbred (Brother-Sister). Several offspring from each of those litters were severely affected with health issues, mostly heart problems. 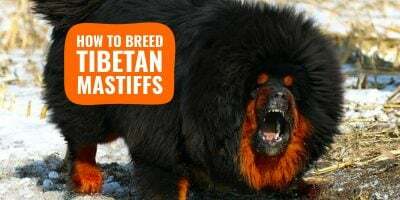 If your only concern is to produce healthy puppies for pet homes, you most likely should start with healthy bloodlines and concentrate on distant line-breeding (4 to 6 generations back) with frequent outcrossing to bring in new genetic material. In my personal experience, this tends to produce the healthiest puppies. 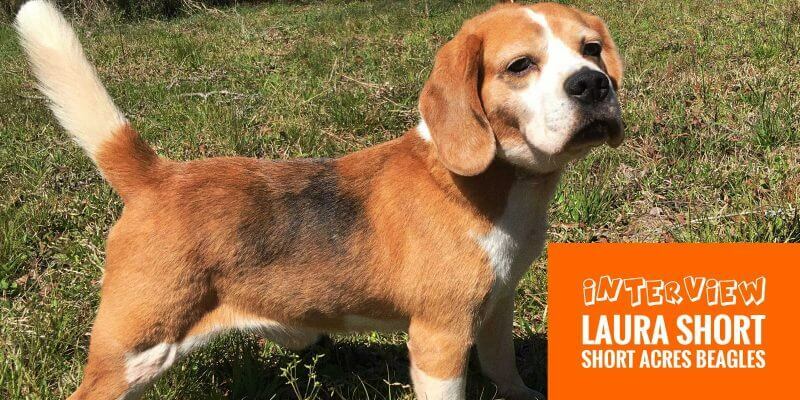 For breeders who are primarily concerned with breeding for the show ring and certain conformation types, you may not be able to consistently produce the physical type (Conformation) to win in the Beagle show ring without close linebreeding. What are the three main health concerns breeders should focus on breeding out urgently? I feel that health concerns in any breed should be ranked by how severely they will affect the quality of life for the dog as a pet. There are other health concerns in our breed that we have tests available for; however, the following three health conditions, which we have no testing available for, should be prioritized in any Beagle breeding program. In the Beagle breed, Epilepsy is one of the most common and feared health problems. For a pet owner, witnessing their beloved Beagle having a seizure can be traumatic; and for the Beagle it can be life-threatening. As there is currently no DNA testing available for Beagle Epilepsy and no way to determine if a Beagle is affected with or carries the gene(s) for Epilepsy, the best we can do as breeders is to be completely honest when we produce a Beagle who has seizures. 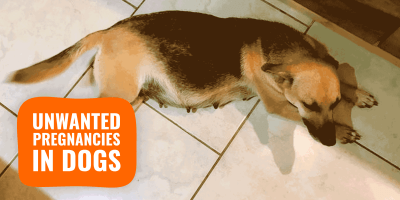 We should be working together with an open mind to breed away from dogs who are known to have seizures and select breeding stock that have a low-risk pedigree for Epilepsy. The second health concern that I feel should be bred away from, is Beagles with severe allergies. Many Beagle breeders and owners have at some point owned a Beagle who seemed like they were literally allergic to the air around them, non-stop itching and a lifelong search for solutions to the constant itching. Frequently, Beagles with such severe allergies have a genetic component that affects their immune system and causes allergic reactions. There is currently no test available for the genetic predisposition for allergies in Beagles. The best we can do as Beagle breeders is avoid using Beagles with severe allergies in our breeding programs, to lower the chances of producing puppies with severe allergies. The third health concern that I would like to see breeders work towards eliminating would be Intervertebral Disc Disease (IVDD). IVDD can cause immeasurable suffering to affected Beagles as well as be expensive for their owner to treat. Again, there is no test available to determine if a Beagle will be affected by or carry the gene(s) for IVDD, so Beagle breeders should avoid breeding dogs who are known to have IVDD or produce puppies affected with IVDD. Are you worried of the rise in the demand for miniature and teacup “beagles”? 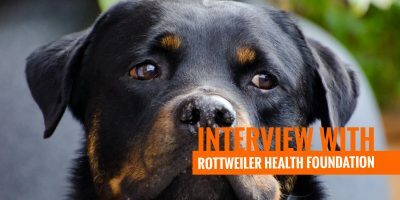 Is it a threat to the breed’s overall health? I do have concern over the demand for pocket (miniature) beagles, which have always been a controversial subject. In the mid ‘90s, my father owned several pocket beagles, they all had severe genetic health problems and never lived past 8 years of age. To my knowledge, there are currently no pocket beagle breeders in the world who do full genetic health testing prior to breeding their dogs. Pocket Beagles are either selectively bred from purebred Beagles that are exceptionally small (which is not recommended because smaller size is frequently associated with more health problems), or they are the result of mix breeding Beagles to other small breeds such as Chihuahuas or Dachshunds (which is not recommended because you are introducing unpredictable temperament and health conditions from those breeds, into the Beagle gene pool). Pocket Beagles are generally only associated with unreputable breeders because reputable breeders select for Temperament & Health before they breed for size. Most families will agree that a good temperament and good health are much more important than the size of the Beagle. Overall, I feel that the demand for pocket beagles has diminished in the past 10 years, as the public has become more educated in what to look for in a responsible breeder. I do not feel that pocket beagles will pose a threat to the overall health of the Beagle breed, as the educated Beagle breeder and buyer recognize that it is only a fad and not representative of an average Beagle. 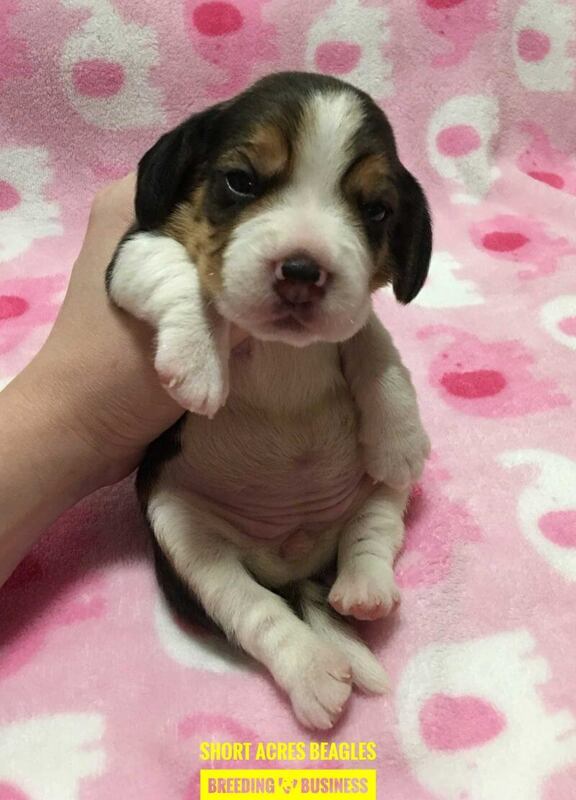 A beautiful Beagle puppy bred by Laura from Short Acres beagles. What are the best actionable advice you could give a breeder starting with beagles? I would begin by reading the AKC Beagle breed standard, studying what health problems are common to the Beagle breed, and taking the time to carefully research Beagle bloodlines. There is a large range of bloodlines in the Beagle breed, based on the purpose that each bloodline was bred for (Field, Show, Pet). You should study the differences and decide what purpose that you want to breed for before you purchase your first Beagle. After careful research, I would begin by purchasing the best quality female Beagle that I could afford. I would health test her using the recommended health tests in the Beagle breed (Hips, Eyes, MLS, and either Thyroid or Cardiac). Evaluate your female and determine what her strengths and weaknesses are in Temperament, Health, and Breed Type. Breed her to a male Beagle who does not share the same weaknesses as your female, preferably a male who has strengths where your female is weak. It is equally important that you research their pedigrees to see if they are compatible, breeding close relatives is highly frowned upon because it can cause you to unknowingly “double up” on undesirable genetic traits. When the puppies are born, evaluate them and keep the best (based on your breeding goals) female offspring from each litter. Repeat the same breeding strategy with each of the females that your keep for your breeding program. What are the grooming requirements for a healthy Beagle? And what diet do you recommend? Beagles have low grooming requirements in general. A common problem with Beagles is excess wax in their ears and ear infections. I recommend cleaning your Beagle’s ears every two to four weeks. An overall brushing with a Bristle brush every two to four weeks will help your Beagle to maintain a sleek coat. A Beagle’s nails should be trimmed or dremeled every two to six weeks. Beagles generally only need a bath once a month or when they get dirty. 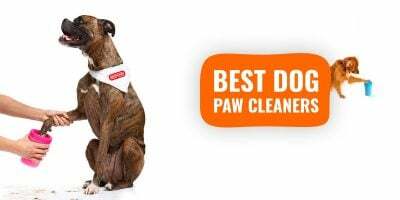 As for diet, I have tried nearly every dog food on the market including homemade and raw. If you have children in your home or concerns over cleanliness, I would not recommend raw feeding due to the risk of salmonella. I no longer feed or recommend raw feeding for this reason. For our family, homemade dog food was not well suited to our family schedule. I personally believe that although grain-free kibbles are a great choice for pet dogs, grain-free kibble usually contains ingredients such as peas and lentils, which have been known to cause fertility issues in breeding dogs. I have also found that my breeding females especially, stay in much better physical condition and have better reproductive success when they are fed a mainstream name brand kibble with carbohydrates that is balanced and contains added fish oil. In your opinion, where is the breed going to be in ten or twenty years? Feel free to leave a comment below, and reach out to Laura Short directly on Twitter, Instagram or Facebook. Do you have a form to fill out for your puppies. Recently lost my 13 year old beagle. Looking for a puppy replacement. Thank you. She Smith. Laura Short, is hands down the best beagle breeder that I have come across. Why, because she has scruples that she does not deviate from in her breeding program. We are proud owners of her beagles, Our Princess Cheyenne lived to be almost 17 years old. Lucy is happy and healthy at 11 years old, and we are happily getting Prim in a couple of weeks from Laura. When I first started looking into buying a beagle 12 years ago, I researched breeders for over 6 mos. Laura’s ethics and high quality program was hands down the one for us. We traveled from Jacksonville, Fl to Bonneau SC to get Cheyenne, and it was the best thing we ever did. Now, 3 beagles later, there is only 1 beagle breeder in my book, and that is Laura Short, of Short Acres Beagles.